There's no denying that this inspirational ebook has had a profound influence on my personal development growth. If you look around this site you'll see that I've mentioned A Happy Pocket Full Of Money several times. It really was at the forefront of my success in making the positive shifts in my thinking and in achieving happiness. Just days after I watched Oprah's show, I joined Bob Doyle's Wealth Beyond Reason program and was recommended to read this inspirational ebook. I was at the moment in my life when I was the most confused, the most scared, the most unsure about what path to take next. I knew I needed to make choices and changes in my life but I had no clear direction. I had so many wonderful things to be grateful for but I just was NOT able to see them and embrace them as the gifts that they were. Reading A Happy Pocket Full Of Money lifted me up to a place I never dreamed I could be but was so grateful to have found. I felt certainty, hope, and ultimate peace. It instantly changed me from the inside out. I felt like this book just guided me through step by step on how to live life - talking about the importance of gratitude, having goals, giving, and SO much more. It explains how and why the world works as it does and backs it with science and spirituality. It explains the relationship between science and spirituality in the most uncomplicated way. It's the kind of inspirational ebook about why we are here that you always wish existed but thought it never did. I believe that these fundamental teachings have been out there in one form or another since humanity began, many of which are referenced in the book, but you don't really find them until you are seeking them. At least that's when it seems to sink in. Of course when you first start reading, this kind of profound information can be hard to process right away. That's why the author, David Cameron Gikandi, cautions readers to just read it through one time even if some of it doesn't make sense. Just keep going because further chapters will make clear some things that you may not have understood in earlier chapters. That was definitely my experience. There were plenty of "a-ha" and lightbulb moments throughout. With some of the chapters, I would read them and my head would unconsciously be nodding in agreement and I'd catch a small smile coming over my face. It was coming from a "knowing" deep inside that this was actually The Truth about life. What made it so easy to hear and read was his style of communicating. David Cameron Gikandi's words are such a gift. It was like reading the words of a good friend or family member spoken with love, encouragement and most of all Truth. I guarantee that you'll want to re-read it instantly with the new awareness that you'll have. Repetition is just SO incredibly important when you are trying to instill new ideas and ways of living... I can't stress that enough. 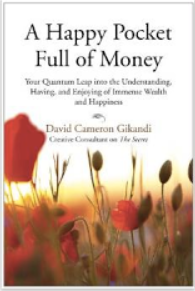 A Happy Pocket Full Of Money is the kind of inspirational ebook where once you read it, your life is forever changed. There's no chance you can go back to where you were before and you will have no choice but to move forward, but now with an inner peace and faith that will stay with you always. Did you know that Rhonda Byrne, prior to creating The Secret discovered A Happy Pocket... and David was a Creative Consultant on the film.